Excursions in the cities art of Tuscany. just a stone’s throw from the Spedale del Santa Maria della Scalawhich today houses an important cultural centre, you will find the Centre of Contemporary Art in a Renaissance building. The wealth of Siena’s museums can offer the 14th century dreams of Duccio di Boninsegna and the rich Sienese school that developed from him; and then the works of Iacopo della Quercia, Francesco di Giorgio, Beccafumi, Sodoma. Riches that belong to the entire territory. For those who are seeing it for the first time, this is the Palio. For the Sienese it is life, passion, history. It’s the miracle of a game that becomes real life, where there is a place for joy and pain, courage and intrigue, loyalty and betrayal. A mediaeval inheritance which, on 2nd July and 16th August deeply affects Siena life and is always a catharsis..
Pope Pius II’s “ ideal town ” di ”, now recognised by UNESCO as “World Heritage”, has taken the place of the castle of Corsignano which for centuries overlooked the boundaries between the lands owned by Siena, Florence and Orvieto. In 1458 Enea Silvio Piccolominidecided to transform the village of his birth into a symbol-town of the Italian Renaissance. Over the three years from 1459 to 1462 the new Pienza saw the creation of the luminous Cathedral of the Assuntawhich contains works by major Sienese artists of the day and is flanked by the imposing Palazzo Piccolominiwhose loggia offers a celebrated panoramic view over Val d’Orcia; then there is the Town Hall and the Bishop’s Palace with its museum. The church of San Francesco (13th century), the walls and the austere parish church of Corsignano are mediaeval, the latter mentioned for the first time in 714. Towards the south a road going up and down through the hills leads to the fortified village of Monticchiello which has preserved various mediaeval buildings, a fortress with long stretches of wall and the 13th century church, dedicated to Saints Leonard and Christopher which contains interesting remains of frescoes.. It was made famous by Brunello, one of the world’s best red wines. But Montalcino is also a magnificent city of art which, from its hill, dominates the 3000 hectares of vineyards (1500 for Brunello) that have given it fame and wealth. Straddled between the basins of the Ombrone and the Orcia, the centre is overlooked by the Fortress built in 1361 to consolidate the fact that Montalcino had become a possession of Siena. 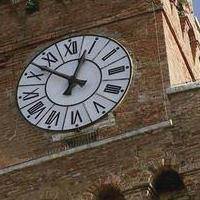 A second symbol of Montalcino is the slim tower of the Town Hallbuilt between the 13th and 14th centuries. At the foot of the tower Piazza del Popolo and the Gothic Loggia. In the historic centre the churches of Sant’Agostino and Sant’Egidio (14th century) are worth a visit, as is the Civic and Diocese Museum which houses Della Robbia terracotta works and paintings and sculptures from the 14th to the 20th century. Roads winding among vineyards lead to Torrenieri , Sant’Angelo in Colle e Poggio alle Mura . From Castelnuovo dell’Abate you reach the abbey of Sant’Antimo, one of Italy’s Romanesque masterpieces. Situated on the slopes of the mountain of the same name, Cetona retains the characteristic structure of mediaeval settlements with alleys and little roads that wind spirally nel oro on their way to the Fortress. The prehistoric settlement of Belverde 40.000 years old, is worth a visit. The Monte Cetona Civic Prehistory Museum is interesting with its finds from the Palaeolithic to the Bronze Age. In the Parish Church of San Michele arcangelo. With its more than 200 hotels and its spa centres specialised in curing liver and kidneys, in inhalation therapy and in functional reactivation and re-education, Chianciano Terme is one of the most important spa centres in Italy. And its fame in the field of spa cures has continued without interruption for more than 2000 years. This is borne out by the many Etruscan and Roman archaeological finds that are continually being discovered throughout the territory and are collected in the recently opened Civic Archaeological Museum. The tourist can also visit the historic centre. In its evocative alleys which open into picturesque piazzas there are authentic art treasures such as the Church of San Giovanni, with the Museo della Collegiata and the Church of the Company (1517); just outside the Porta al sole, the small but precious Chiesa della Madonna della Rosa1585) was built to Baldassarre Lanci design. The optimal weather conditions and uncontaminated nature of these places also favour a stay that is solely climatic. Highly important in the Etruscan period, Chiusi experienced its greatest splendour under the legendary king Porsenna. Very significant finds from archaeological digs that are still successfully under way may be seen at the National Etruscan Archaeological Museum. Opposite the latter is the Duomo. Opposite the latter is the Duomo which already existed in the 12th century and was transformed in 1585, and next to it the Cathedral Museum, established in the 1930’s, which houses important objects including precious illuminated missals. Numerous Etruscan tombs have come to light on the territory: Pellegrina, Scimmia, Leone, Pania and a great many others. Christianity spread very swiftly in these places, as borne out by theCatacombs of Santa Mustiola and of Santa Caterina. Over and above the catacombs you can also see the so-called Labirinto di Porsenna, an intricate network of underground passages leading to a cistern dating to the 1st century AD. As a result of the foregoing, but also of its considerable natural attractions, Chiusi is developing its capacity for tourism. An important element is the lake of Chiusi, downstream of the town, which offers the possibility of sport fishing and birdwatching. This splendid little town – whose artistic and architectural heritage led it to be called the Pearl of the Cinquecento – has preserved its beauty intact. Going up the steep streets of its outlying districts the visitor discovers beautiful palazzos and churches imbued with the unparalleled art of foremost Renaissance architects. The splendid Piazza Grande, must be seen: the Duomo with its uncompleted façade and the Town Hall, surrounded by Renaissance palazzos. The valley below is an unforgettable view with the outstanding and elegant mass of the Tempio di S. Biagio. Montepulciano is also a very lively cultural centre. The best known events are the International Art Workshop and the Bruscello, a popular amateur theatre performance whose ancient tradition is rooted in peasant life. Side by side with a still highly important agricultural economy, today there is a notable tourism industry of which one of the main elements is Montepulciano Spa in the locality of S. Albino where the curative properties of mud and waters are exploited. This small centre in the extreme south of the province of Siena, on the boundary with Umbria and Latium, was already well known in the middle ages, and today’s visitor sees it precisely as a typical mediaeval village, dominated by the massive rectangular turret of Palazzo Bologna. The historic centre is worth a visit with its characteristic hill town-plan of alleys and small piazzas. Away from the centre, near the Spa, the Chiesa Basilicale which dates to the year 1000 is of great interest. But though San Casciano, immersed in a lush and uncontaminated nature, is a favourite with farm holiday visitors, it should not be forgotten that a great many tourists come for spa cures such as inhalations, baths and mud treatments. Just a few kilometres away there is the small outlying district of Celle sul Rigo with its majestic 13th century tower and an unforgettable view. Tourists visiting these places must absolutely not miss tasting the typical local products.